“Ghesse-ha” is another one of those movies from this years programming that I picked because they offer a window into another world – in this case, Iran. The result was one of the movies that impressed me the most at this years Viennale. Loosely connected by the story of a reporter who, after a long absence, gets back into the country to shoot a documentary, “Ghesse-ha” tells a couple of masterfully interwoven tales, thus creating a largely depressing, occasionally amusing, often touching, but always fascinating portrait of contemporary life in Iran. It would be a crime to talk too much about each of the segments, since one of the movies main appeals is to find out again and again where Rakhshan Bani-Etemad is going to lead us next. So lets just say that the stories are sometimes very different in content and style, which makes the movie very rich in variety. Over the course of the movie, it touches on very different topics, like poverty and economic exploitation (f.e. there’s a woman who fights against the owners of a factory that stopped paying her and the other employees their loans), health care (a retiree with an health issue who seeks help from a public servant; definitely one of the lighter, funnier segments, and also ample proof that red tape really lurks everywhere), drug-abuse (with a clinic for addicted women), education/literacy (a man has to ask his wife to read a letter to him that she got from a former lover), and the oppression of free speech by the regime. By far the best segment, however, features a young woman and a young man driving in a minivan. It’s a scene that goes on for about 10-15 minutes, and during that duration, it hits so many different notes. It’s funny, sad, romantic, tragic… and ultimately culminates in a gut-wrenching ending that sent shivers down my spine. That fantastic scene alone, which ranks very high up there with the best that I’ve seen all year, was already more then worth the price of the cinema ticket. If you should ever get the chance to check out “Ghesse-ha”, I highly implore you to do so. 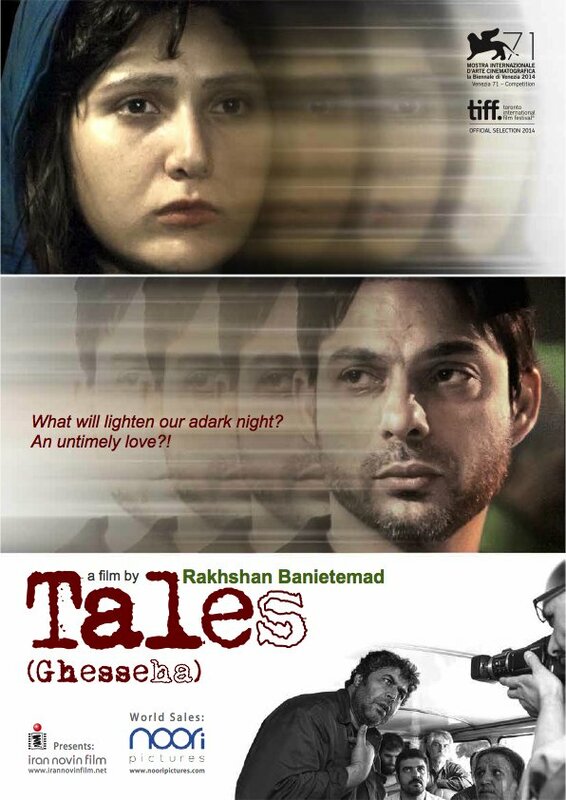 This entry was posted in cinema 2014, movie reviews, Viennale and tagged Ghesse-ha, Iran, Rakhshan Bani-Etemad, Tales. Bookmark the permalink.